B2B features– Using a B2C ecommerce store and extending it to your B2B customers does not alone make it a B2B ecommerce store. The needs of your B2B and B2C customers are very different and no one size can fit all. 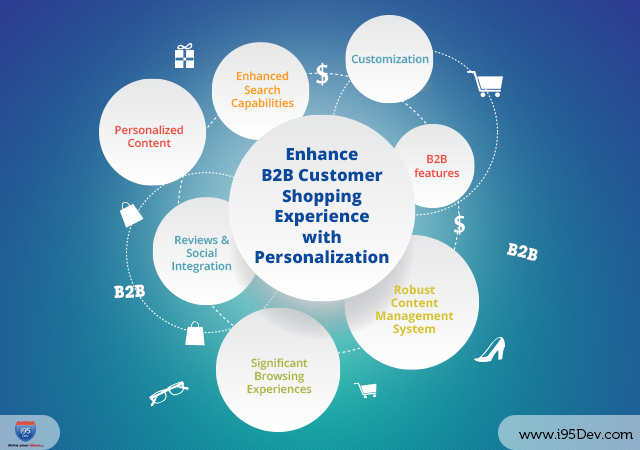 Below highlighted few features which are critical for your B2B ecommerce store; businesses can leverage these B2B features to gain competitive edge over their competitors. The difference between B2C and B2B ecommerce approaches might make the adoption of consumer e-commerce features feel counter intuitive. But, at the end, B2B procurers are the consumers who make purchases for their employers. By incorporating targeted B2C ecommerce features into B2B e-commerce platforms, brands can benefit from their customers’ familiarity with common online buying tools as well as the significant improvements those features bring in to the customer experience. To know more, feel free to contact us at http://www.i95dev.com/contact/ or give us a call at 301.760.7499. Our team of well experienced and well trained professionals will be more than happy to serve you at your convenience.